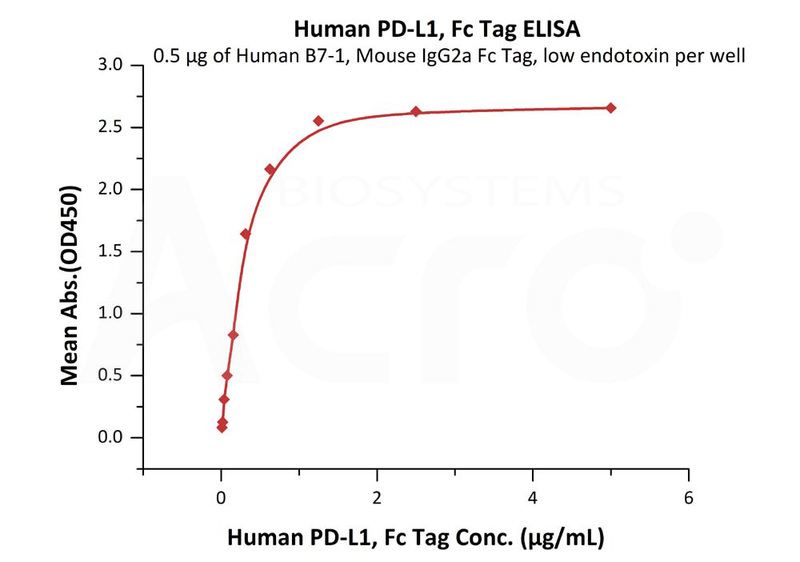 Human PD-L1, Fc Tag (HPLC-verified) (PD1-H5258) is expressed from human 293 cells (HEK293). It contains AA Phe 19 - Arg 238 (Accession # NP_054862.1). The protein has a calculated MW of 51.4 kDa. The protein migrates as 60-75 kDa under reducing (R) condition (SDS-PAGE) due to glycosylation. >90% as determined by SEC-HPLC. 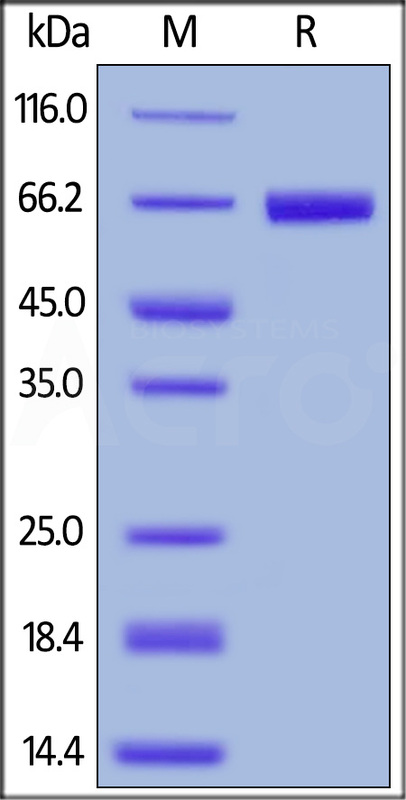 Human PD-L1, Fc Tag (HPLC-verified) on SDS-PAGE under reducing (R) condition. The gel was stained overnight with Coomassie Blue. The purity of the protein is greater than 95%. 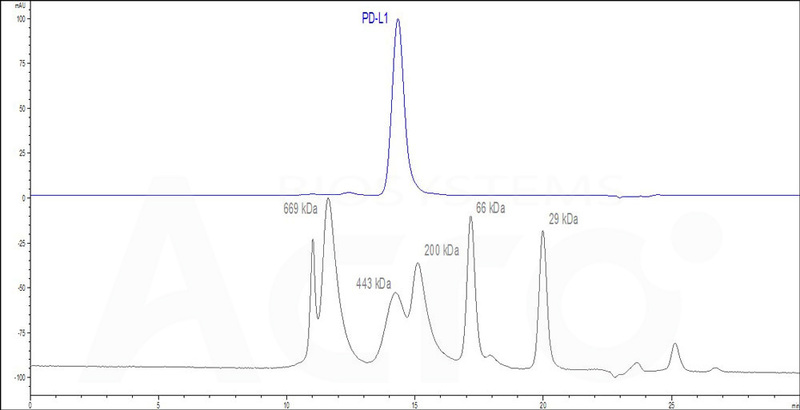 The purity of Human PD-L1, Fc Tag (HPLC-verified) (Cat. No. PD1-H5258) was greater than 90% as determined by SEC-HPLC. Immobilized Human PD-1, Strep Tag (Cat. No. 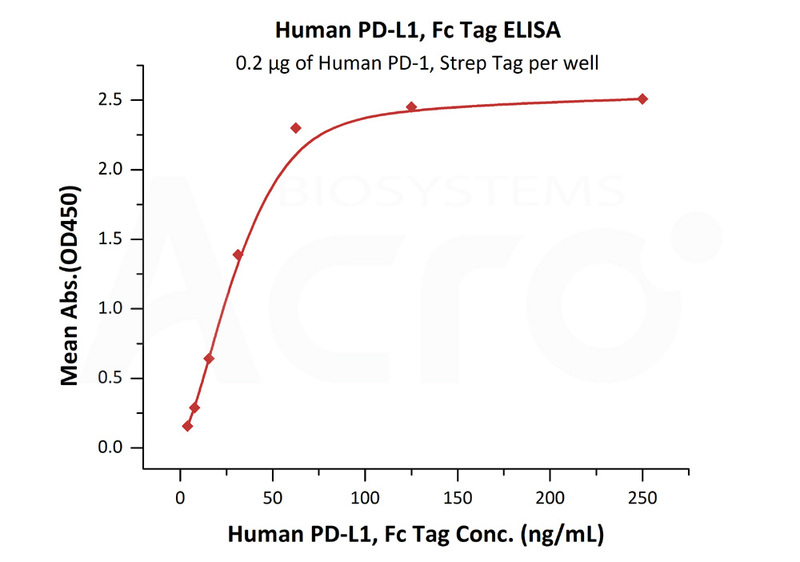 PD1-H5284) at 2 μg/mL (100 μL/well) can bind Human PD-L1, Fc Tag (HPLC-verified) (Cat. No. PD1-H5258) with a linear range of 4-63 ng/mL (QC tested). Immobilized Human PD-L1, Fc Tag (HPLC-verified) (Cat. No. 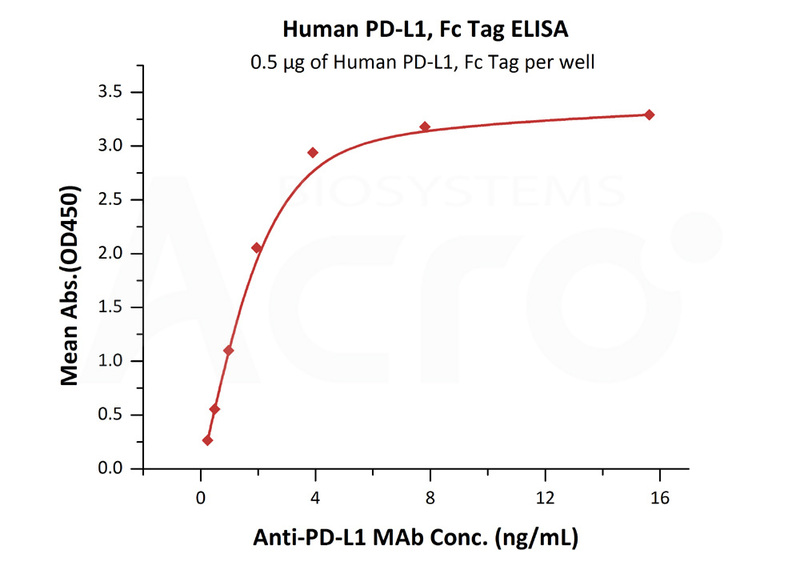 PD1-H5258) at 5 μg/mL (100 μL/well) can bind Anti-PD-L1 MAb with a linear range of 0.2-2 ng/mL (Routinely tested). Immobilized Human B7-1, mouse IgG2a Fc Tag, low endotoxin (Cat. No. B71-H52A4) at 5 μg/mL (100 μL/well) can bind Human PD-L1, Fc Tag (HPLC-verified) (Cat. No. PD1-H5258) with a linear range of 0.01-0.313 μg/mL (Routinely tested). 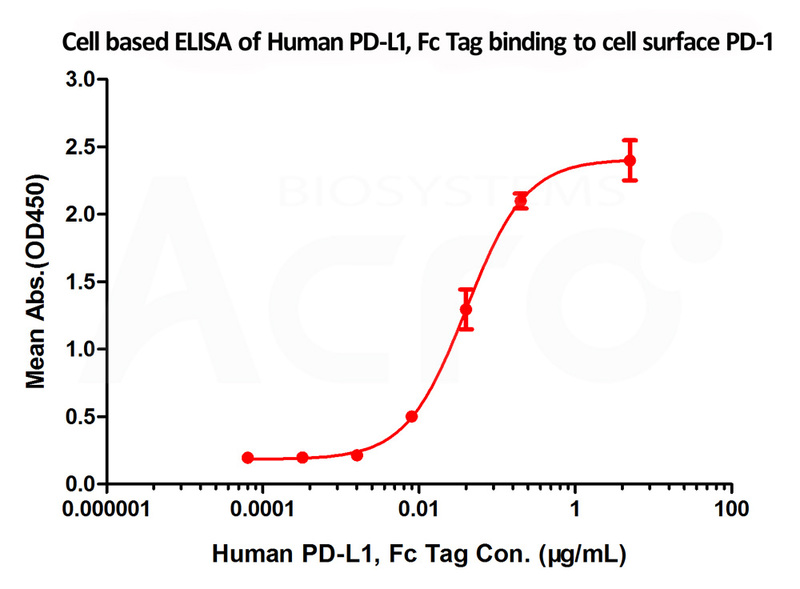 Immobilized cell surface PD-1 (5x104 of cells per well) can bind Human PD-L1, Fc Tag (HPLC-verified) (Cat. No. PD1-H5258) with an EC50 of 0.029 μg/mL (Routinely tested). 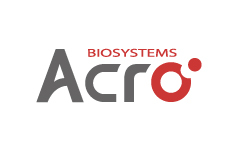 Flow Cytometry assay shows that recombinant Human PD-L1, Fc Tag (HPLC-verified) (Cat. No. PD1-H5258) can bind to 293 cell overexpressing human PD-1. 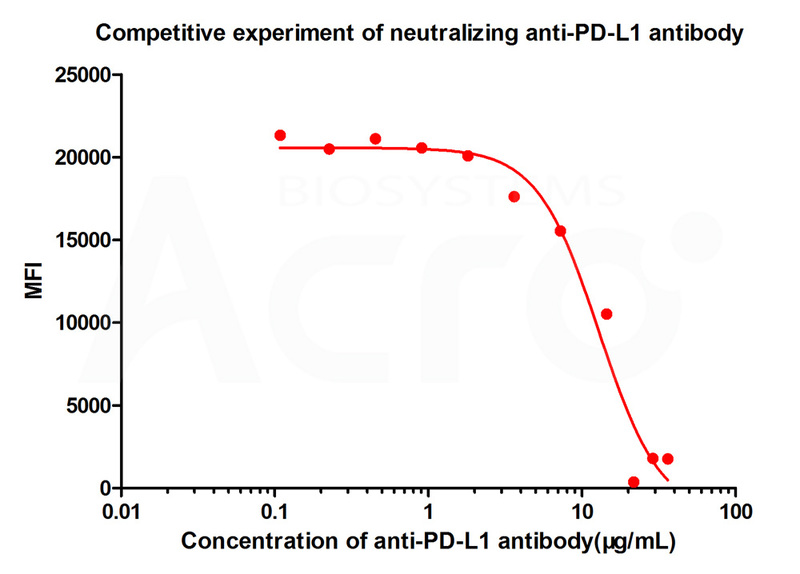 The concentration of PD-L1 used is 10 μg/mL (Routinely tested). 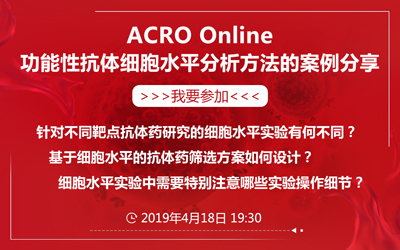 FACS analysis shows that the binding of Human PD-L1, Fc Tag (HPLC-verified) to 293 overexpressing PD-1 was inhibited by increasing concentration of neutralizing Anti-PD-L1 antibody. The concentration of PD-L1 used is 10 μg/mL. 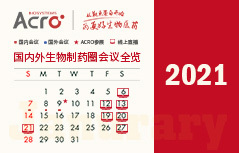 The IC50 is 12.92 μg/mL (Routinely tested). Authors: Boohaker RJ, et al. Authors: Yam Alice, et al. Programmed cell death 1 ligand 1 (PD-L1) is also known as cluster of differentiation (CD274) or B7 homolog 1 (B7-H1), is a member of the growing B7 family of immune molecules and is involved in the regulation of cellular and humoral immune responses. B7-H1 is a cell surface immunoglobulin superfamily with two Ig-like domains within the extracellular region and a short cytoplasmic domain. PD-L1 is highly expressed in the heart, skeletal muscle, placenta and lung and weakly expressed in the thymus, spleen, kidney and liver. 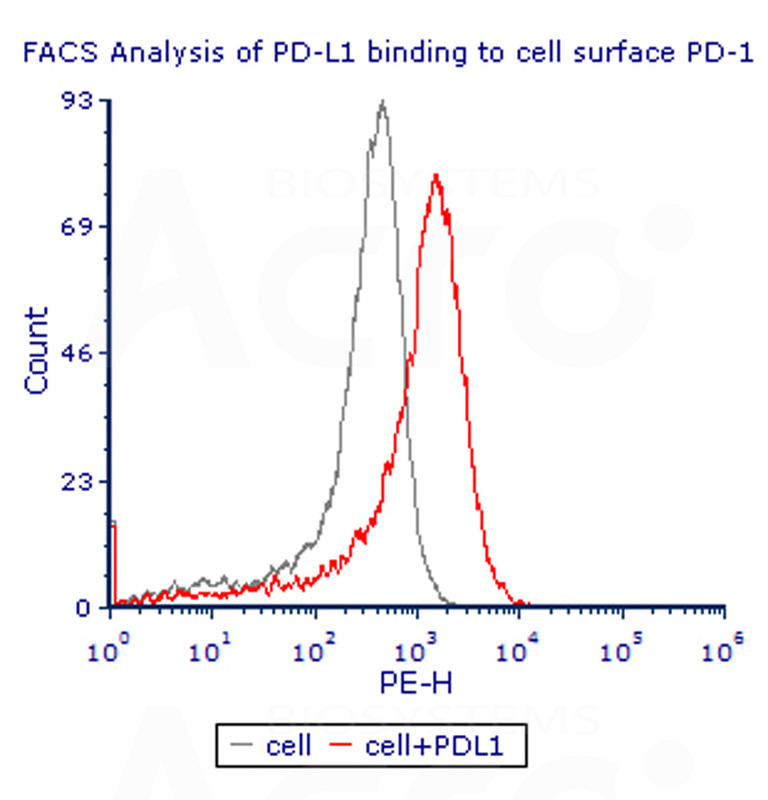 PD-L1 is expressed on activated T-cells, B-cells, dendritic cells, keratinocytes and monocytes. 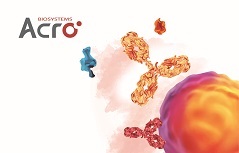 PD-L1 is up-regulated on T- and B-cells, dendritic cells, keratinocytes and monocytes after LPS and IFNG activation and up-regulated in B-cells activated by surface Ig cross-linking. PD-L1 involve in the costimulatory signal, essential for T-cell proliferation and production of IL10 and IFNG, in an IL2-dependent and a PDCD1-independent manner.